Next week’s referendum on whether to leave the EU is an issue that cuts across traditional lines of ideology or party loyalty. Update: Hours after this report was published, Labour MP Jo Cox, a supporter of the Remain campaign, was murdered. For more, see this report by Maria Margaronis. London— Viewed from far enough away—from the perspective, say, of British astronaut Tim Peake, 250 miles above the earth in the International Space Station, or a Nation reader on her way to work aboard the D train—the referendum on June 23 over whether the United Kingdom should leave the European Union might look deceptively obvious. On one side are continued membership in the world’s biggest single market in goods and services—importing more than the United States and exporting more than China—and the continued survival of a political project that turned the charnel house of the 20th century into a continent at peace and the destination of choice for the world’s refugees. On the other side, the right to keep Polish plumbers and Italian biologists and Slovakian waiters from coming here to work. Not only have the overwhelming majority of British economists warned that a vote for Brexit risks sending the country back into recession, but a group of 13 Nobel Prize–winning scientists, including physicist Peter Higgs (of the eponymous boson) and geneticist Paul Nurse have signed a letter arguing that leaving would pose a “key risk” to British science. Stephen Hawking has said Brexit would be “a disaster for UK science.” The long list of artists, writers, and performers campaigning for Remain includes Benedict Cumberbatch, Hilary Mantel, Jarvis Cocker, John le Carré, Tracey Emin, Tom Stoppard, Sophie Okonedo, and Tacita Dean. The closer you get to the actual debate, the more complicated the issues become. The Leave camp has Nigel Farage—leader of the far-right UK Independence Party—former London mayor Boris Johnson, Downton Abbey creator Julian Fellowes, Michael Caine, and ex-Python John Cleese. Yet the closer you get to the actual debate, the more complicated the issues become. Partly this is due to the referendum’s origin—a panicked concession by Prime Minister David Cameron to his party’s xenophobic right wing in order to neutralize the threat posed by rising sympathy for UKIP among core Tory voters. And partly because once you get beyond the headlines, this is an issue that cuts across traditional lines of ideology or party loyalty. When Britain first joined what was then called the Common Market in 1973 it was during a Tory administration; the fall of Edward Heath’s government the following year triggered the first ever UK-wide referendum, held in June 1975, on whether the country should stay in Europe. The “Yes” camp, supported by Labour Prime Minister Harold Wilson, won with over 67 percent of the vote. But the Labour Party itself was deeply divided, with Tony Benn and most of the left leading the “No” campaign, who argued that the treaty negotiated by Heath would hurt British workers and hit consumers with higher food prices. Forty years later the two parties have exchanged positions—with only a tiny handful of Labour MPs supporting Brexit, while for the Tories the referendum has become a proxy leadership battle between Cameron and his heir apparent, Chancellor George Osborne, on the Remain side, and Johnson and Justice Secretary Michael Gove for Brexit. So long as this looked like a Tory fight, Labour seemed content to remain on the sidelines. Party leader Jeremy Corbyn—who voted “No” in 1975, opposed Margaret Thatcher’s 1987 Single European Act and the Maastricht Treaty (signed by John Major), which created the European Union in 1993, and voted against the Lisbon Treaty in 2008—did eventually commit himself and his party to Remain. But his intervention on this issue has been incoherent and ineffectual enough to prompt speculation that were Corbyn free to vote his own conscience he would be happier on the other side. The clearest example of what Europe has become is the treatment of Greece, where civil servants, pensioners, and ordinary taxpayers have been economically crucified to satisfy the demands of German bankers—aided and abetted by northern European politicians unwilling to tell voters the truth that solidarity is not a one-way street, and that if they want to keep exporting cars and fridges and washing machines they need to make sure their prospective customers can afford to keep buying. Keynes knew this in the 1930s—and Henry Ford even earlier. But Europe seems to have forgotten, as it also has forgotten what happens when a continent slams shut the gates on refugees. Class and class resentments are very much factors in the debate. Meanwhile, here in Britain the level of debate has been shockingly poor. 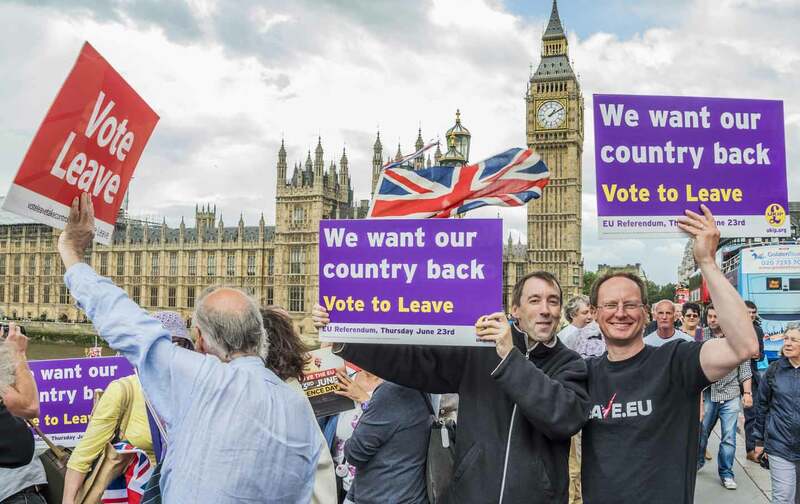 The Leave campaign has been as shameless as Donald Trump—using discredited figures of the EU’s cost and bogus claims about immigration to stampede voters toward the exit on the right. And the BBC—the country’s supposedly authoritative source of information—has been paralyzed by fear of appearing partial into a posture of permanent false equivalence, so that any fact or statement supporting one side has to be immediately “balanced” by one on the other side, a charade that may have reached its nadir when the bulletin announcing the Nobel laureates’ letter was “balanced” by the news that James Dyson, inventor of the bagless vacuum cleaner, was for Brexit! Finally, just to muddy the waters further, class and class resentments are very much factors in the debate. The most recent poll—which puts “Leave” four points ahead, but with 11 percent still undecided—also reveals a huge gap between ABC1 (upper, middle, and lower-middleclass) voters, who favor remaining by 49 to 39 percent, and C2DE (skilled working class, working class, and subsistence level) voters, who want to leave by 53 to 29 percent. Those voters are probably not going to be won around by letters to The Guardian. They might, however, be open to persuasion by the Labour Party, which though late to the fight seems to finally be committing some of its bigger guns, including former prime minister Gordon Brown—reprising his role as a grimly effective foe of Scottish independence—and shadow foreign secretary Hilary Benn, who on Monday delivered by far the best speech on the Remain side. Why should Americans care about any of this? Because the question of which people fear the most, immigrants or economic calamity, isn’t just a European issue—or an abstraction. If fear and hatred of foreigners trumps (I couldn’t resist) economic self-interest to the point where Britons vote themselves over an economic cliff, that doesn’t bode well for America either. Nor will the US economy be immune from the after-effects of the European disintegration that would likely follow. And not just in Scotland and Northern Ireland, whose citizens, whatever their other differences, are passionate about remaining in Europe—and where the pressure to dissolve the United Kingdom would increase markedly. But in Holland, where Geert Wilders, head of the far-right Freedom Party, predicted his country would hold its own referendum soon afterward. Because while Europe’s critics on the left may have the best arguments, the current campaign is driven not by them but by the nationalist right, and being conducted not on the terrain of democracy and workers’ rights but on the basis of fear and greed—the urge to remove the few remaining impediments to exploitation provided by the European Working Time Directive, and discard restraints on the freedom to pollute imposed by European environmental laws. Sometimes what you stand for matters less than whom you stand with. Both sides in this fight have reasonable grounds for an argument—but those are not the grounds we’re on right now. And when one side has all the bigots, all the reactionaries, and all of those who resent any infringement of the power of money, progressives have an obligation to offer resistance, not rationalizations.